What’s needed to start a career flying drones? Obtaining your Remote Pilots Licence (RePL) is the first step in CASA’s drone certification process. To be able to operate remotely piloted aircraft systems (RPAS), otherwise known as drones or UAVs, for commercial or business purposes, becoming certified will offer the greatest flexibility to pursue future opportunities. The unmanned aviation industry is set to grow significantly in the next decade and remotely piloted aircraft have already begun replacing manned aircraft in many roles. In a recent industry forum, a spokesperson from the Civil Aviation Safety Authority (CASA) explained that between now and 2020 the commercial unmanned aviation sector is projected to grow by up to 500%. In addition, Price Waterhouse Coopers values the global market for drone powered business solutions at $127 billion. Now is the time to begin a career in this rapidly developing industry. The requirements for drone certification depend on the size of RPA you intend to fly, together with whether you are operating for recreational or commercial (hire or reward) purposes. If you are flying privately for sports or recreation, your RPA is deemed a model aircraft and no licence or certification is required in most cases (unless you are flying very heavy model aircraft). The graphic below can assist you in determining what form of drone certification you require. Further information in detail is located beneath. Taking photographs and video (providing it’s not for reward or any form of economic gain). However, if you intended to make money from your drone (such as selling your photos) or other commercial purposes (such as using drones to assist your business operations), you may need to become certified. What is an ReOC and RePL? For people new to the industry these two terms can be very confusing and used incorrectly. The easiest way to understand it is the ReOC (RPA Operators Certificate) is the certification a business (including sole trader) or organisation requires. 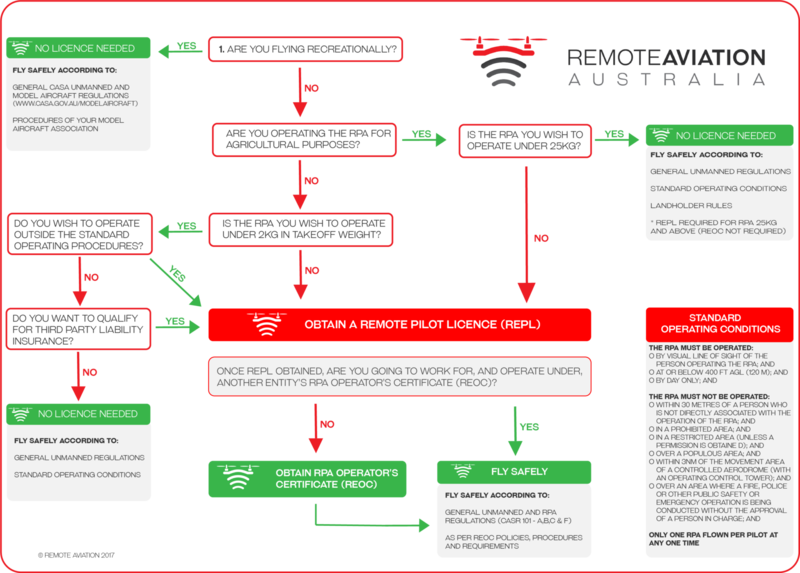 On the other hand, the RePL (Remote Pilot Licence) is what individual RPA pilots need to have to operate drones commercially while working for the ReOC holder. If you intend to work for a company that operates RPA, all you need is an RePL. However, if you want to set up your own drone business, you will require an ReOC (for the business) and an RePL (for you – the pilot). The ReOC authorises the holder to conduct RPA operations for commercial purposes. The types of remote aircraft, and any specific conditions, are endorsed on this certificate together with any instruments of approval provided by CASA. Only CASA, or a delegate, can approve ReOCs, which require a formal submission process including the development of operational manuals, operating procedures, and the nomination of a Chief Remote Pilot. Remote Aviation Australia have significant experience helping people apply for an ReOC and are happy to assist anyone that flies with us. The RePL can be obtained by conducting an RPAS training course with a CASA-approved training organisation, such as Remote Aviation Australia*. Once obtained, the RePL will list any conditions or restrictions that apply to the holder. Examples include the category of RPA you are permitted to fly (for other than recreational purposes), such as multirotor or aeroplane (fixed-wing), and weight limitations. For RPA weighing less than 25 kg, a generic grouping is endorsed on the RePL, such as “multirotor <7kg” or “aeroplane <25kg”. After obtaining your initial RePL qualification, additional privileges can be obtained by conducting ‘operational’ training by an approved training provider, such as Remote Aviation Australia. You may have heard about the changes to the regulations that occurred in September 2016. The ‘new’ Civil Aviation Safety Regulations (CASR) Part 101 legislation includes a new type of operation known as “Excluded RPA”. This is also referred to by some people as the “sub-2kg” rules. Basically, “Excluded RPA” is the term given to any drone flying activities that don’t require certification in the form of an operators certificate and/or remote pilot licence. The new Excluded RPA legislation allows individuals to conduct certain flying for commercial gain, without obtaining an RePL or applying to CASA to an ReOC. For example, if you operate a very small RPA for commercial purposes, that weighs less than 2kg (this is where the “sub-2kg” name comes from), you can fit within the Excluded RPA category. The new legislation also allows individuals, such as farmers, much more flexibility when it comes to operating drones over their own property. If you intend to operate drones weighing less than 25kg over your own land, and adhere to the “landholder rules” (such as not charging other people for the service), you may also operate as Excluded RPA. However, if you want to fly a remote aircraft weighing 25kg or more, you must obtain a remote pilot licence (but no ReOC is required). We view these rules as a positive thing for individuals as it allows you to fly without the expense of applying to CASA for an ReOC or conducting RePL training. It has also allowed our former students to start flying for commercial gain while they await their ReOC to be processed. Only one RPA flown per pilot at any one time. The SOCs can be quite restrictive for a number of reasons. The first is size of the RPA you intend to fly – you must fly a drone that weighs less than 2kg. 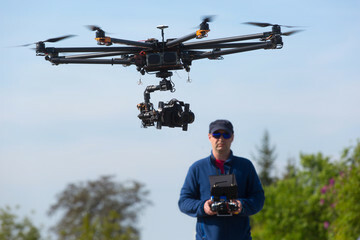 This rules out a number of professional RPA such as the DJI Inspire, M600 or S1000, and will limit you to more “prosumer” equipment like the DJI Phantom or Yuneec Typhoon. The SOCs are also quite limited as night flying is not permitted, you cannot operate close to people, within 3nm of a controlled aerodrome etc. It is unlikely Excluded RPA operators will be able to do much more than simple aerial photos and videos. Working under an ReOC will give you far more freedom as a professional, with many people already realising the benefits far outweigh the relatively small cost of an RePL and ReOC. For example, ReOC holders can fly closer to people (30 metres down to 15 metres) and apply to CASA to fly at night, beyond visual line of sight, within restricted areas and closer to aerodromes. You’ll be able to operate larger drones, offering you the freedom to attach more sophisticated equipment and carry heavier payloads. The other benefit of holding an ReOC is the ability to get public liability insurance. At the moment it is very difficult for Excluded RPA operators to get public liability insurance, leaving them extremely vulnerable to financial ruin should an accident occur.